Here's the acoustic guitar that needed no “quiet room” to be heard at the 2003 Healdsburg Guitar Festival or the 2004 Newport Guitar Festival. If snakes were this loud and clear, nobody would ever get bit. Three weeks of hot, damp weather on the East Coast kept the varnish from drying in time, but didn't keep this axe out of the 2003 Healdsburg show. 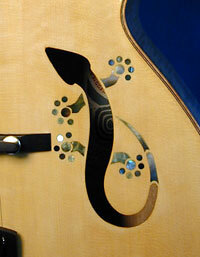 The latest 12-string reso makes it's debut at the 2005 Healdsburg Guitar Festival. Personally, I really like bats. This is not strictly an homage to Meatloaf.